On the 10th day of Muharram, known as the day of ‘Aashura, in the year 61 A.H. when Imam Abu ‘Abdillahil Hussein (as) came into the tent to bid farewell to his family members, he held the hand of his sick son, Ali ibn al-Hussein (as) and pressed it against his chest. He (as) then said, “O son! 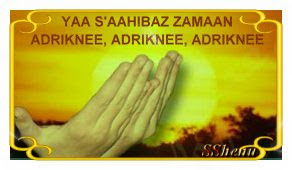 I am teaching you a dua’ which you should remember. Angel Jibrael taught it to my grandfather the messenger of Allah who passed it to my mother Fatima. Whenever you have a special need or are faced with any calamity or crises, or are inflicted with any grief or hardship, then recite the following supplication”: By the truth of Yaseen (a title of the Holy Prophet) and the Quran full of wisdom And for the sake of Taa-haa (another title of the Holy Prophet) and the great Quran O He Who is able to fulfil the desires of those ask. O He Who knows what is in the heart. O He Who banishes sorrow from the sorrowful. O He Who dispels grief from those who grieve. O He Who is merciful to old men. O He Who provides for infants. O He Who needs not to be explained. Send blessings upon Muhammad and his progeny and fulfil for me…(mention your wishes) Transliteration BIHAQQI YASEEN WAL QUR-AANIL ‘HAKEEM WA BIHAQQI TAA-HAA WAL QUR-AANIL ‘ADHEEM YAA MAN YAQDIRU ‘ALAA ‘HAWAA-IJIS-SAA-ILEEN YAA MAN YA’LAMU MAA FID-DHAMEER YAA MUNAFFISAN ‘ANIL MAKROOBEEN YAA MUFARRIJAN ‘ANIL MAGHMOOMEEN YAA RAA-‘HIMA SHAYKHIL KABEER YAA RAAZIQAT TIFLIS-SAGHEER YAA MAN LAA YAHTAAJU ILAT-TAFSEER SALLI ‘ALAA MUHAMMADIN WA AALI MUHAMMADIN WAF-‘AL BEE ……. (mention your wishes) Mafateeh al-Jinaan, page no. 380 Ask your Hajaats after reading this Dua'. Insha'Allah your Duas' will be accepted May Allah swt fulfill all your legitimate wishes with the Wasila of this Dua' (courtesy - Al Mahdi Center - Wesses - UK) Hussayn is the Guiding Light and Shipe Of The Salvation" Holy Prophet (saw) May Allah the Almighty put Barakah (Blessing) and Noor (Light) and Kabul (Acceptance) in everything we say and we do. May Allah guide us to the straight path, may Allah give us Light, Basira (vision), Wisdom, Comprehension, Understanding, Sincerity, Truthfulness, and the ability to see what's right and what's wrong.